In the original ZOMBIES VS ROBOTS, there was one surviving human character, a baby named after my daughter. She, uh, didn't make it out of the story intact (the character, I mean--the real kid is fine). But since then, I've felt a little guilty and figured I needed to do something in comics that would make her proud of me. I might've hit on that thing, at least until she outgrows these kinds of books. 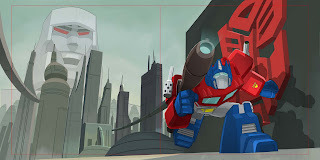 In May, we're going to be doing a TRANSFORMERS picture book--that is, a hardcover-with-dustjacket, squarebound, 32-page thing, similar to the other kids' books we've been doing through our Worthwhile Books like. I wrote this first one, called I AM OPTIMUS PRIME. The art is being handled by Joe & Rob Sharp, and the image here is the art that will make up the wraparound dustjacket. The characters are being modeled after the "Robot Heroes" toy line, but the book itself will be something new: not quite a normal picture book and not quite a comic book, but rather some sort of hybrid of both, with lushly painted art from the Sharps. And since this sort of book is exactly what my kid is into right now, AND she knows who Bumblebee and Optimus Prime are, well, this will hopefully make up for the ZvR thing. At least until she's old enough to read. Wow. Very cool, love classic picture books and adding this to their number will be awesome. Great for kids which is cool too. This is something I would like to get to read to my son; looks very cool. Will it be available through diamond and comic retailers or will it be available in major bookstores? BUT is there a character named Lucy in the TRANSFORMERS book? That would blow her mind! >This is something I would like to get to read to my son; looks very cool. Will it be available through diamond and comic retailers or will it be available in major bookstores? Both. It'll be offered in the Previews in stores in March (for May release) but also at your Borders, Barnes, Amazon, all of that. >BUT is there a character named Lucy in the TRANSFORMERS book? Absolutely. This one will feature Lucee -- Arcee is old news. Now that looks damned good. Art is nice, but a distracting lack of contrast in Prime's face. Very cool. I'll definately pick a copy up for my daughter. If your life feels like it is lacking the power that you want and the motivation that you need, sometimes all you have to do is shift your point of view.People say I was the greatest ever to play to the game. I cringe a little bit. I receive it as an opinion. But for me personally, I never played against Jerry West. I never played against Elgin Baylor. I never played against Wilt Chamberlain. Yeah, I would’ve loved to. But to say I’m better than those people is not for me to decide. I’m happy for the accomplishments and what people might say. But just to be a part of that debate is a privilege. But I would never give myself that type of accolade because I never competed against everybody in this Hall of Fame.